My goals were to burn 2400 cals a day and eat 1600 cals. That would be around 700-800 cals deficit a day. That would be about 1.5 lbs a week. The problem I'm having is that I can't burn 2400 a day easily. I'm up and down all day and I try workout in the morning, but all I can seem to burn is 2100-2200. Hmmm.....I may have to lower my expectations a little bit. Or I may have to adjust my goals down a little to 1 lb a week. Of course, I'd be happy to lose 1 lb per week, I don't know what the heck I'm talking about. Sheesh, like I'm losing so much now right?? Okay, I'm working on it and that's the most important part. 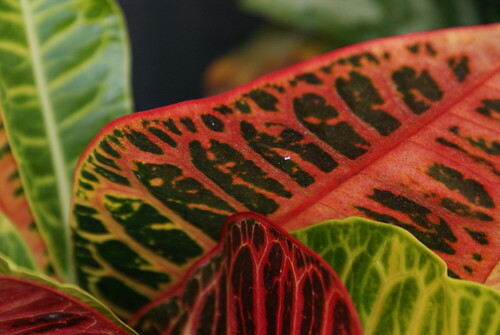 This is a plant out front. I just like the colors of it. 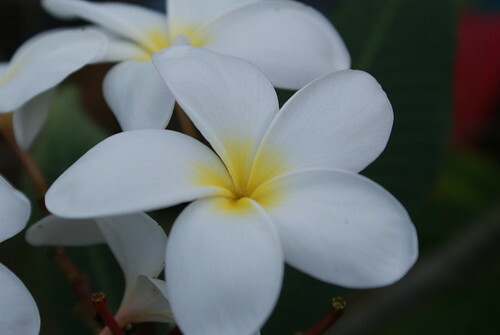 An this is a white plumeria we have in the yard. NIce photos! I can almost smell the plumeria! I had Hawaii dreams last nite....ahhh! Great pictures Flo, keep at it!